Women who have exceeded previous caffeine guidelines "should not panic"
Pregnant women should cut their caffeine intake and drink no more than two cups of coffee or four cups of tea a day, a government agency has advised. The Food Standards Agency (FSA) has lowered its recommended levels of the stimulant from a maximum of 300mg a day to 200mg - a reduction of a third. 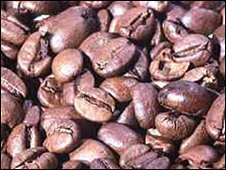 It follows research by Leicester and Leeds universities linking caffeine to babies born with low birth weight. The study will be published in the British Medical Journal this week. Children born with a low birth weight are more likely to suffer health problems like heart disease and diabetes. The advice means women should stick to a maximum of two average-sized cups of coffee per day - although those who have been drinking three cups have been told not to panic. The FSA's chief scientist Andrew Wadge said: "This is new advice but these are not new risks. "I want to reassure women that if you're pregnant and have been following the previous advice, the risk is likely to be small." The FSA guidance means women should limit themselves to three or four cups of tea a day and watch their intake of cola, chocolate and energy drinks. Drinks bought from coffee shops may be far higher than the FSA estimates for the average-sized home-made cup. The university study which prompted the revised guidance involved 2,500 pregnant women. The new guidance follows another study suggesting drinking alcohol lightly during pregnancy cut the risk of problem behaviour and hyperactivity in boys. The University College London report found boys born to light drinkers did better on vocabulary tests than those born to mothers who abstained completely during pregnancy. Current medical advice is that women should avoid alcohol while pregnant or trying to conceive. The British Coffee Association said it would be revising its guidance to healthcare professionals and consumers in line with these recommendations with immediate effect.